Pioneers in the industry, we offer readymade manndona vol-02 patiala suit, salwar kameez, fashion salwar kameez, exclusive salwar kameez, fashion salwar suit and printed patiala suit from India. Colors are fresh for the season, the prints are delicate over economical quality fabrics that enthuses once you buy you indulge into an inseparable journey of fabrics that never fades out of the style horizon and embroidery work on neck style. This printed readymade outfit comes along with Maroon Color Cambric cotton top with cotton inner, Yellow color cambric bottom and Mal fabric dupatta and available in L, XL and XXL sizes. 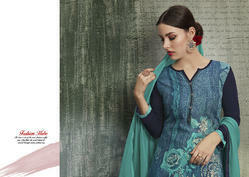 We are offering Printed patiala to our valuable customers while keeping in mind their demand. We offer product to meet the satisfaction of customers by our best product. Full Set Price: Rs 11988. We are offering patiala suits to our valuable customers while keeping in mind their demand. We offer product to meet the satisfaction of customers by our best product.